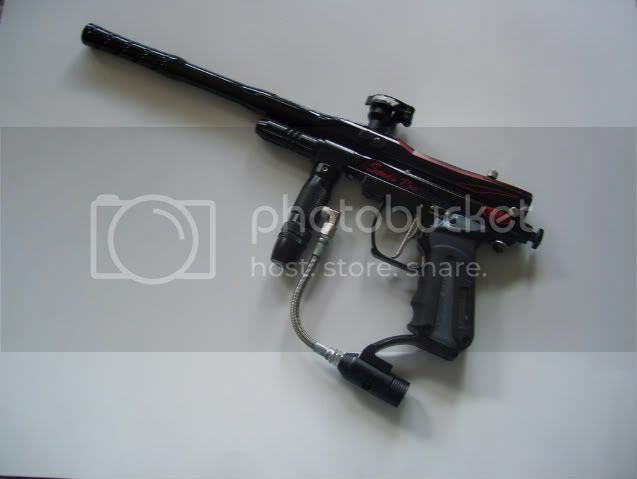 you can't really make a paintball gun more "powerful." You can make it more consistent, efficient, accurate, etc. If you really want a military look, I'd just buy a new marker. By the time you buy magazines and stocks, you're going to spend a ton of money and you might as well have a new marker. It looks similar to the MR4 but it has the option to use a magazine but does not have the EKO valve. As far as other performance goes, I'd get a nice hopper and a better barrel to start. Also switching to compressed air will help your marker shoot better as well. Your choices are wide. Generally speaking, you get what you pay for. Also, scopes on paintball guns are pointless since paintball markers aren't very accurate.